. You can subscribe to the print edition or download a digital version here. This content won't appear online, it's exclusive to the magazine. Australia had a phenomenal year at global awards shows in 2017. While a lot of the success was dominated by a handful of shops, and one in particular, what is good for one Australian agency is good for the whole nation. It puts the spotlight on Australian creativity and reminds us that we’re not a creative backwater, but a global powerhouse of creativity. That level of success may be hard to replicate in 2018, but it’s a great dream to chase. 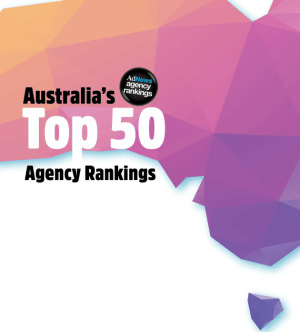 The AdNews Top Agency Rankings give a benchmark of the success Australian agencies had at local and international award shows. Points are awarded for awards won in 20 local and international award shows. You can find the methodology here. Clemenger BBDO Melbourne topped the table - again - leaving everyone else in its wake. One constant of Clemenger's storied 70-year history has been success, but the agency’s awards performance last year is unprecedented. It swept the floor at Cannes, bringing back 56 Lions in total, and being named global Agency of the Year up against the best of the best from across the world. It also won five categories at the AdNews Agency of the Year Awards, including overall Agency of the Year, and was Campaign Brief Agency of the Year too. Its work for TAC, the now-famous Graham, was a stand out for the agency, with other notable work, such as Airbnb’s ‘Until We All Belong’ and Mars ‘Hungerithm’ earning them metal at nearly every award show. But, while the points gap between the leader and its rivals is significant (you could drive a sizeable truck through it) beyond Clemenger’s breakaway success there were other awards highlights for Australian agencies this year that should not be forgotten. Second place in the rankings went to The Monkeys. The formerly independent agency had a dramatic year by all accounts, and is now part of Accenture Interactive following its acquisition. AWARD and surprisingly, the Media Federation of Australia awards, garnered most of its metal this year. Its Qantas Out of Office Travelogue did well, as did its work for The University of Sydney. Sitting at third on the table, CHE Proximity had a strong 2017, driven by one of its most prevalent campaigns to date for Cochlear, 'A Hearing Test in Disguise'. The creative integration of a hearing test hidden within an emotive ad impressed at local awards and international shows and it picked up points at Cannes, Spikes, Clios, One Show overseas and at home, MFA, AWARD ADMA AC&E, and Effies. R/GA also had a good year, placing fourth overall in the ranking. The bulk of its award success came from its ‘'Through The Dark' work for Google. The interactive film integrated Australian hip hop act the Hilltop Hoods as part of a campaign for Google Play Music. The goal was to create an immersive digital experience allowing the user to navigate through two simultaneous 3D worlds, being the 'The Dark and The Light', by rotating their mobile device. For every listen, Google and Hilltop Hoods donated $1 to support young people living with cancer. Another notable success this year was GTB - the bespoke agency set up for Ford. Sitting just outside the Top 20, the collaborative shop did well at The Australian Effies and MFA awards. In the media stakes, Mediacom Melbourne topped the list, and while the majority of its points came from collaborative awards when Clemenger took home metal, it demonstrates that a solid working partnership between creative and media results in effective and award-winning work. With effectiveness being the key to successful work, BMF’s standout performance at the Australian Effies can’t be ignored. It scored more than double the points here than any other agency with work for the Football Federation of Australia doing well. Thanks to Clems’ performance, the Omnicom group scored more points than any other holding group this year. The majority of points came from Cannes Lions, accounting for 21% of all the points scored, followed by AWARD which accounted for 20%, The MFAs at 11% and the AdNews Agency of the Year Awards which account for 9%. The rankings this year also show the dominance of holding groups and networks, with very little presence from independent shops. Very few agencies from outside Sydney or Melbourne make the Top 50, but of those Clems Brisbane, Y&R Brisbane, 303MullenLowe Perth and Brisbane-based Publicis Q are the top scoring. Interestingly, Mullen Lowe’s Perth shop outperformed Sydney, which is a testament that Sydney and Melbourne are not always the dominant locations within a network. 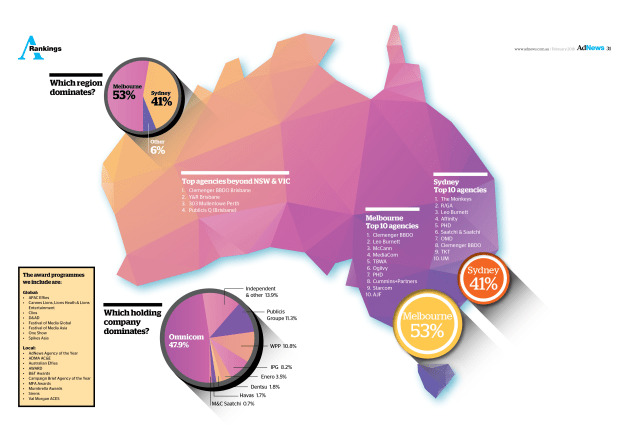 The full Top Agency Rankings can be found in the February edition of AdNews. You can subscribe in print or get the digital edition via Zinio. This is an excerpt from the February issue of AdNews. You can subscribe to the print edition or download a digital version here. This content won't appear online, it's exclusive to the magazine.